The daffodil is most commonly associated with the Spring equinox. It blooms in bright daylight colours and different shades of the sun. Mostly golden in the centre, bell shaped and triple layered, they come in a variety of features. The flowers resemble the tutu skirts of ballerinas. After the snowdrops in their white bridal gowns, the crocus bridesmaids followed after, and now a golden team of daffodil ballet dancers spin. 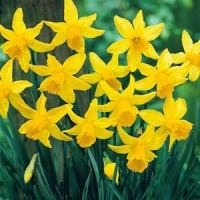 The daffodil's true name is Narcissus. Named after a handsome, vain man (demigod) from Greek mythology, who enjoyed looking at his own reflection. He was so in love with himself that he ignored a woman (nymph) called Echo who was in love with him. While staring at himself in a pool, Narcissus fell in the water and died. A plant grew there, and it was a daffodil. Also a girl goddess, Persephone, was picking daffodils when she was abducted by the god Hades who took her to the underworld and kept her there as his bride. Daffodils have often been flowers with polar meanings, positive and negative, good luck flowers, or flowers of bad omens. Flowers of death and broken love. Flowers of fortune and power. Despite it's beauty, daffodils are quite poisonous. The daffodil bulb resembles an onion and many have made a mistake of eating them. Although onions are too hot to eat raw, they're a healthy ingredient in cooking but onions are edible and non-toxic. Daffodil bulbs are toxic and can cause anything serious from severe, vomiting, stomach cramps and diarrhea. Yet since ancient times, daffodils provide medicines and treatments.